FORT LEE, Va. – Find convenience and the latest information at your fingertips at the Defense Commissary Agency’s new and improved Web site: www.commissaries.com. DeCA has retooled its Internet site to include fresh new graphics that change with each season and a new section that promotes health and wellness. The single biggest addition is its “Ask the DeCA Dietitian,” a nutrition forum hosted by Army Reserve Maj. Karen Fauber, a registered dietitian. Customers can exchange questions, comments and experiences on nutrition topics with the DeCA dietitian and other users. The site also helps customers make healthy financial choices by listing what’s on sale in the “Savings Aisle” under the “shopping” tab. Customers can print a list of all items on sale at their local commissary, and find Internet coupons on the ‘Links’ page. If saving money is especially appealing, check out DeCA’s comprehensive case lot sale page available during its sale event every May and September. This Web page is particularly popular with authorized shoppers who live a long distance from a commissary, but are willing to make a special trip, where savings can run as high as 50 percent, compared to commercial prices. Last, but certainly not least, you will find Kay’s Kitchen online. If you’re stumped about what to prepare for dinner, look for inspiration here, where you’ll find lots of quick, easy and nutritional recipes using both classic and diverse ingredients from apples to zucchini. DeCA’s Web site is a great way for commissary shoppers to discover their benefit and stay connected to what’s happening in their commissary – wherever in the world they and their families are stationed. For more information, go to: www.commissaries.com. FORT LEE , Va. – American military commissaries, the “supermarkets to the military” at bases in the United States and across the globe, will reach their 140th anniversary on July 1. On that day in 1867, the Army was authorized by Congress to begin selling food items, called “commissary” items, “at cost,” to soldiers of all ranks. This landmark event began the modern era of American military commissaries. Commissaries today little resemble the warehouses that doubled as sales stores in 1867, but there are vital similarities: they still sell food items, at cost, to officers and enlisted alike, providing a savings benefit that encourages reenlistment by stretching military paychecks. They also boost morale by providing “a taste of home” to locations around the world. In the 19th century, Army rations lacked the variety and balance necessary to maintain health. Soldiers supplemented their diets by purchasing healthful foods, such as canned fruits and vegetables, from licensed vendors known as “sutlers.” Starting in 1825, officers were allowed to buy commissary items at cost from the subsistence department, but enlisted men had to continue buying from sutlers, who sold for a profit. The result of this class division was that enlisted men paid higher prices for nonration food items than did their officers. During the Civil War, many soldiers were poorly served by sutlers who overcharged or provided poor-quality goods. After the war, Congress decided that enlisted men should receive the same shopping privileges officers had already enjoyed for four decades and extended the benefit to all ranks. At the time, no other nation provided for its enlisted men in such a fashion. The practice was wise, frugal, just and generous, as well as distinctly democratic and proudly American. At first, the stores were open to all active-duty Army personnel, and even civilians could shop at certain posts. The first stock list, in 1868, consisted of 82 items and made the sales commissaries (as they were called at that time) similar to civilian general stores of that era. As time passed, the benefit changed and improved. Civilian post traders, who had been permitted to sell anything commissaries did not carry, were abolished in 1893, and the modern exchange system took their place in 1895. The first overseas commissaries opened in the Philippines in 1899. After the Navy and Marine Corps opened their first commissaries in 1910, personnel from any service could patronize any commissary run by the other armed services. Retired enlisted men became fully eligible shoppers in 1914, spouses and family members were shopping by the 1930s (and earlier in many locations), the Air Force assumed control of Army Air Force stores in 1947-48; and in 1952, a permanent surcharge was added, enabling commissaries to pay many of their own construction costs. Recently, in recognition of their vital contributions, increasing duties, and extended deployments, National Guard and Reserve personnel were authorized full-time commissary benefits. In 1991, to improve efficiency and increase taxpayer savings, Congress and the Department of Defense created the Defense Commissary Agency by consolidating the military services’ separate retail grocery operations into one organization. Since then, customer savings have increased from 20 to more than 30 percent, the agency opened 89 new stores, remodeled or made major renovations to over 60 existing stores, and upgraded and modernized over 100 more. The number of items stocked by commissaries has also increased, from about 13,000 in the largest stores in 1991 to 22,500 in the biggest stores today. Patrick B. Nixon, DeCA’s director and chief executive officer, says commissaries have become increasingly important in a time of tighter budgets, repeated combat deployments, and increased use of the Guard and Reserve. “The commissary benefit helps our people in uniform and their families. When forces deploy, the families left behind depend on their local community services, including commissaries, to see them through. FORT LEE , Va. – The Defense Commissary Agency has reduced its on-the-job accident rate and met all goals set by a presidential initiative to reduce preventable accidents in the workplace. The president’s Safety, Health and Return to Employment initiative, termed SHARE, was launched in fiscal 2004 to improve safety and health in federal workplaces and reduce financial costs to taxpayers. It focused on reducing workplace injuries and illnesses and reducing the number of days lost from work. In addition, the program improved the process for documenting injury compensation claims. Using an array of strategies that relied on command leadership and support and included employee participation, safety awareness and training, hazard identification, and continuous evaluations, DeCA was able to reduce its total accident rate from 4.98 per 100 employees in 2003 to 3.67 per 100 in 2006. This also resulted in a decrease in the agency’s lost-time accident rate from 2.76 to 2.41. Lost-time accidents are those that result in employees losing time at work or put on job restrictions or transfers due to their injuries. Employee participation included quarterly store-level safety councils, department-level safety meetings and the introduction of the “safety-buddy” system, says Mike Corley, DeCA’s safety program manager. “Awareness initiatives included the IMSAFE campaign (Integrated Monthly Safety Action/Focus Elements), which we published and distributed to all facilities monthly,” he adds. DeCA met SHARE objectives by educating managers on the importance of reporting injury compensation claims faster and providing guidance and support on ways to return injured employees back to gainful employment, notes Karen Wells, personnel management specialist in DeCA’s human resources directorate. “Providing a safe environment for our workforce preserves and protects our greatest asset – our people,” says DeCA Director and Chief Executive Officer Patrick Nixon. The success of SHARE throughout the federal government resulted in the president signing a three-year extension of the initiative through 2009. “The military community certainly has a strong sense of family, but focusing on an event like this reminds us just how important something as simple as eating dinner together is to the health of our families,” said Patrick Nixon, director of the Defense Commissary Agency. To draw even greater attention to Family Day, the military sales team of The Coca-Cola Company is sponsoring a three-day, two-night trip to New York . The winner will also get a family dinner cooked by Sandra Lee, best-selling author and host of the Food Network show “Semi-Homemade with Sandra Lee.” Lee’s latest cookbook “Semi-Homemade Grilling” will be awarded to second-place winners. Commissary shoppers can go to the DeCA Web site at www.commissaries.com to access links to the contest, make a “symbolic” pledge to have a family dinner on Sept. 25, get more information about “Family Day,” or find healthy recipes. The contest is open from Sept. 1-30. Lee specializes in meals made by spicing up everyday, store-bought products. “We requested she prepare a ‘healthy’ meal for the winner and she agreed immediately,” said McAlister. DoD schools, TRICARE and family organizations such as the National Military Family Association as well as military Web sites and many others are supporting the Family Day concept. FORT LEE, Va. – Can you spell commissary? A student in Annapolis, Md., won a regional spelling bee recently by getting it right. Military recruits and new or single service members can spell it too, but how many really know what one of their most valuable military benefits can do for them? Single service members can find all their toiletries, snacks, beverages, vitamins and personal care items at cost in their commissary. “The problem is too many service members wait until they get married or have children to start using the commissary regularly. They don’t discover it as soon as they get into the service,” said Nixon. You’re ready to serve your country. Your commissary is ready to serve you. “That’s our most important mission,” said Nixon. And 2006 Commissary Awareness Month activities include single service member tours to showcase commissary readiness to serve. Programs such as Better Opportunity for Single Soldiers, Single Marine Program and Navy Liberty as well as the Air Force First Term Airmen centers, get personal tours of commissaries, win commissary gift certificates funded by industry, and earn Bonus Bucks for their programs through competition for the best tours and events during the month-long event. Another customer favorite, the annual May worldwide case lot sale, also takes place at nearly all commissaries. Customers can find savings of up to 50 percent over regular prices at case lot sales. It’s an experience difficult to describe – and impossible to duplicate. Case lot sale dates and locations are available at http://www.commissaries.com. In conjunction with the “healthy” theme, “Kellogg’s Healthy Beginnings” health screenings will make a repeat appearance at many commissaries in the United States. The first screenings at 100 commissaries in March were a success as customers got a chance to get blood pressure and cholesterol readings, and a health assessment kit for body mass index measurement and fiber needs. A list of stores and dates will appear on the front page of http://www.commissaries.com in May. The screenings are administered by health care professionals through a company contracted by Kellogg’s. shopping environment. Authorized patrons purchase items at cost plus a 5-percent surcharge, which covers the costs of building new commissaries and modernizing existing ones. Shoppers save an average of 30 percent or more on their purchases compared to commercial prices – savings worth about $2,700 annually for a family of four. A core military family support element, and a valued part of military pay and benefits, commissaries contribute to family readiness, enhance the quality of life for America’s military and their families, and help recruit and retain the best and brightest men and women to serve their country. “A test – I knew something was going on around here!” the customer finally exclaims. “This produce is the best I’ve ever seen in all my years as a commissary shopper, so keep it up!” As this customer discovered much to his delight, when it comes to commissary produce, the best just got better. A six-month “local purchase” produce test in southeast Virginia’s Hampton Roads area commissaries achieved resounding success that should prove exciting to patrons, commissary employees and produce vendors alike as the program launches worldwide. DeCA’s chief executive officer and acting director, Patrick Nixon, said the goal is to complete transition to a new way of doing business by Oct. 1. Commissaries are ready for Valentine’s Day – Are you? Tell your loved ones how you feel about them this Valentine's Day with help from your commissary! Commissary products and services ranging from candy and fresh fruit to skin and hair care products to make you look your best are all available at great low commissary prices. If you’re thinking outside the traditional box of chocolates (yes, we have those) and flowers (we have those, too) you’ll find the commissary has a wide variety of products that will help you make Feb. 14 special for you and your loved one. You can find all you need to prepare a romantic dinner or party at home, and you won’t even have to cook everything thanks to the services our bakeries, delis and other departments offer. The 2006 Scholarships for Military Children application period that began in November enters the final stretch this month with Feb. 22 as the last day applications will be received. Information, applications and the essay topic for this year’s program are available at commissaries worldwide as well as online at the program Web site, www.militaryscholar.org. The program, which is administered by Fisher House Foundation and funded by manufacturers and suppliers of groceries and services in the commissary system, has awarded nearly $4 million in scholarships to more than 2,400 students since the first awards in 2001. Trying to cut the “fat” out of your budget? How about clipping coupons? According to the Promotion Marketing Association 76 percent of the U.S. population clips coupons with savings of $3 billion per year. Commissaries accept manufacturer coupons, military only coupons, and Internet coupons. The use of coupons combined with overall commissary savings of 30 percent or more means you pay less and get more at your commissary. The Web site www.couponmonth.com offers useful clipping advice and a spreadsheet to track your coupon savings. As DeCA continues its “It’s Your Choice, Make It Healthy” campaign, Kay Blakley, DeCA Europe’s consumer advocate and host of “Kay’s Kitchen” television spots, points out the health value of commissary shopping in meeting daily physical activity needs. “I logged 2,500 steps on one trip through an average size commissary. That translates to over 100 calories burned just from the steps taken, but doesn’t include those used in lifting or toting products, stooping to retrieve them from the bottom shelf, stretching to pluck them from the top shelf, or any other physical moves involved in grocery shopping.” She explains more about how to make healthy choices in her new “Kay’s Kitchen” news release found on DeCA’s Web site at https://www.commissaries.com/. This cold and flu season stop by the commissary for the treatment of what ails you. Our wide assortment of over-the-counter remedies can help you treat the aches, runny nose, congestion and coughing that are common during this time of year. And it’s all available at significant savings. Retired military service members who are planning to travel overseas need to plan before visiting an overseas commissary. Access to overseas commissaries is controlled by Status of Forces agreements or other agreements between the host nation and the United States. Based on the terms of these agreements, overseas military commands publish regulations that specify who is entitled to use commissaries in their areas. In some areas, retirees are denied commissary access. Before traveling, log onto http://www.commissaries.com, and check out the store Web pages of the overseas commissary you may want to visit. The commissary’s “location/phones” page provides information on how to contact the store directly. It is always a good idea to visit the Web site of any overseas installation that you will be visiting for security status and customs information as well. Don’t get so busy during the holidays that you forget to pick up your Scholarships for Military Children application. Information and applications for the 2006 Scholarships for Military Children program are available at commissaries worldwide as well as online at the program Web site, http://www.militaryscholar.org. The program, which is administered by Fisher House Foundation and funded by manufacturers and suppliers of groceries and services in the commissary system, has awarded nearly $4 million in scholarships to more than 2,400 students since the first awards in 2001. Applications must be turned in at a commissary by Feb. 22, 2006. Thousands of American troops are involved in relief efforts in the wake of Hurricane Katrina. Military families are also among those displaced by the disaster. Now, a link at www.commissaries.com will connect those interested in helping military families with a “gift of groceries.” The donated gift certificates can be used to assist military families in purchasing groceries at a commissary while they are temporarily housed at other installations. “Several organizations, including the Air Force Aid Society, the USO and Fisher House Foundation already receive thousands of dollars in commissary gift certificates every year to help military families in need,” said Patrick B. Nixon, chief executive officer and acting director of the Defense Commissary Agency. “In this case, Fisher House Foundation and Air Force Aid Society are in a position to distribute gift certificates to military families from the affected area.” The “Gift of Groceries” program is made possible through a business agreement with CertifiChecks, Inc., at no cost to DeCA or the federal government. The program allows anyone to purchase commissary gift certificates to donate or give as gifts, but only authorized commissary shoppers can spend them. The return of Dollar Days! FORT LEE, Va. – Commissaries are again accepting computer-generated Internet coupons with a couple of requirements to guard against fraud, Defense Commissary Agency officials announced. This week all 273 commissaries around the world began accepting computer-generated Internet coupons that meet the following criteria: they must have a bar code that store checkouts can scan and they cannot be for free product. Photocopied or facsimile-generated coupons remain unacceptable at all commissaries. “Internet coupons are a popular medium customers use to save money, so we wanted to work out a way to provide this service. We’ve analyzed this issue and these requirements should adequately protect us against fraud while giving our customers the kind of the service they want,” said Scott Simpson, DeCA’s chief operating officer. DeCA as well as other grocery retailers had stopped accepting home-printed coupons in September 2003 as an interim measure while the grocery industry grappled with losses incurred because of their fraudulent use. Analysts estimated the loss by coupon fraud to be millions of dollars to the grocery industry, which ultimately costs consumers in the form of raised prices to recoup losses. Later this month, the agency’s Web site, www.commissaries.com, will re-establish links to Internet grocery coupon sites for the convenience of commissary shoppers. FORT LEE, Va. – Long considered the favorite child in the berry family, the strawberry – it turns out – is not just all sugar and fun. It’s serious food that packs a nutritional wallop. Eight medium-size fresh strawberries contain about 150 percent of the recommended daily intake of vitamin C. In fact, according to the California Strawberry Commission, pound for pound, strawberries have more vitamin C than oranges. They’re also loaded with folic acid, fiber and potassium. Shoppers will find a bumper crop of berries at the commissary. According to Polly Ring, commissary management specialist at DeCA, they are plentiful this season. 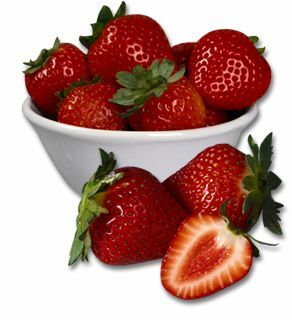 · Choose strawberries with a bright red color and fresh green caps. · Dry, firm, fully ripe berries are best. · Strawberries do not continue to ripen after they’ve been picked so avoid berries that are partly white and unripe. A strawberry’s size isn’t an indication of its sweetness or taste. That’s determined by the variety of strawberry, weather and growing conditions, and the degree of ripeness when picked. Fully ripe berries, large or small, will be equally sweet and flavorful. · A stained box may indicate that some of the berries in it are overripe. · Preserve their food value and quality by handling the berries gently. · Don’t wash them or remove the caps until you’re ready to eat or use them in a recipe. · Store the strawberries uncovered in the refrigerator in the original package or a shallow container only for a day or two. You can also cover the strawberries with a paper towel or plastic wrap with a few air holes punched in to prevent them from drying out. · When you are ready to use the strawberries, wash them quickly in a colander under cold water; don’t let them soak. · Remove their caps with the point of a paring knife or gently twist and pull them off. · Puree fresh strawberries in a blender until almost smooth. Mix in a little sugar and a teaspoon of lemon juice. Serve over ice cream, pudding, short cake or pound cake. · Beat softened cream cheese with enough milk to make a mixture of dipping consistency. Blend in crumbled blue cheese. Use as a dip for fresh strawberries. · Spread a thin layer of light cream cheese on whole grain toast. Top with sliced strawberries and drizzle with honey. · Sprinkle sliced strawberries with sugar. This classic combination makes its own delicate syrup that’s hard to beat. · After filling up on fresh fruit, freeze more for enjoying later in the summer. Freeze hulled strawberries on a cookie sheet, then – once solid – seal them in freezer bags. They’ll be ready to drop into the blender with non-fat milk or yogurt for a quick, healthy smoothie anytime. Frozen strawberries can also be handed to children on hot summer days for a cool, refreshing and nutritious snack. · Strawberries combine well with dry cereal and milk for breakfast or with custards, puddings, tapioca and other desserts made from milk. · Layer sliced, diced or halved strawberries in compotes and trifles. · Use strawberries as garnishes to enhance the appeal of salads, desserts and fruit punches. Cover a tray or cookie sheet with wax paper. Place chocolate chips and shortening in a microwave-safe bowl. Microwave on HIGH 1 - 2 minutes until chips are melted and mixture is smooth when stirred; cool slightly. Holding strawberry by stem, dip two-thirds of each strawberry into chocolate mixture; shake gently to remove excess. Place gently on prepared tray. Refrigerate until coating is firm (about 30 minutes). Store covered in refrigerator. *Butter, margarine and spreads contain water and may prevent chocolate from melting properly; oil may prevent chocolate from forming a coating. The Defense Commissary Agency operates a worldwide chain of nearly 280 commissaries providing groceries to military personnel, retirees and their families in a safe and secure shopping environment. Authorized patrons purchase items at cost plus a 5-percent surcharge, which covers the costs of building new commissaries and modernizing existing ones. Shoppers save an average of 30 percent or more on their purchases compared to commercial prices – savings worth more than $2,700 annually for a family of four. A core military family support element, and a valued part of military pay and benefits, commissaries contribute to family readiness, enhance the quality of life for America’s military and their families, and help recruit and retain the best and brightest men and women to serve their country. and Ships Stores Surcharge: What Is It? Diseases: Campylobactor Bovine Spongiform Encephalopathy (BSE) or "Mad Cow Disease"
The Defense Commissary Agency (DeCA), headquartered at Fort Lee, Virginia, operates a worldwide chain of nearly 300 commissaries to provide groceries to military personnel, retirees and their families. Commissary patrons purchase items at cost plus a 5 percent surcharge, which covers the construction of new commissaries and the modernization of existing stores. Patrons enjoy substantial savings on their purchases. A typical family of four regularly shopping at the commissary can save more than $2,000 per year. These savings enhance the quality of life for America's military and their families. A valued part of military pay and benefits, commissaries help the United States recruit and keep the best and the brightest men and women in the service of their country. Locate military coupons, recipes, and military news.